Histogram matching can be used for object detection in images . This example extracts a single coin from the skimage.data.coins image and uses histogram matching to attempt to locate it within the original image. First, a box-shaped region of the image containing the target coin is extracted and a histogram of its greyscale values is computed. Next, for each pixel in the test image, a histogram of the greyscale values in a region of the image surrounding the pixel is computed. skimage.filters.rank.windowed_histogram is used for this task, as it employs an efficient sliding window based algorithm that is able to compute these histograms quickly . The local histogram for the region surrounding each pixel in the image is compared to that of the single coin, with a similarity measure being computed and displayed. The histogram of the single coin is computed using numpy.histogram on a box shaped region surrounding the coin, while the sliding window histograms are computed using a disc shaped structural element of a slightly different size. This is done in aid of demonstrating that the technique still finds similarity in spite of these differences. 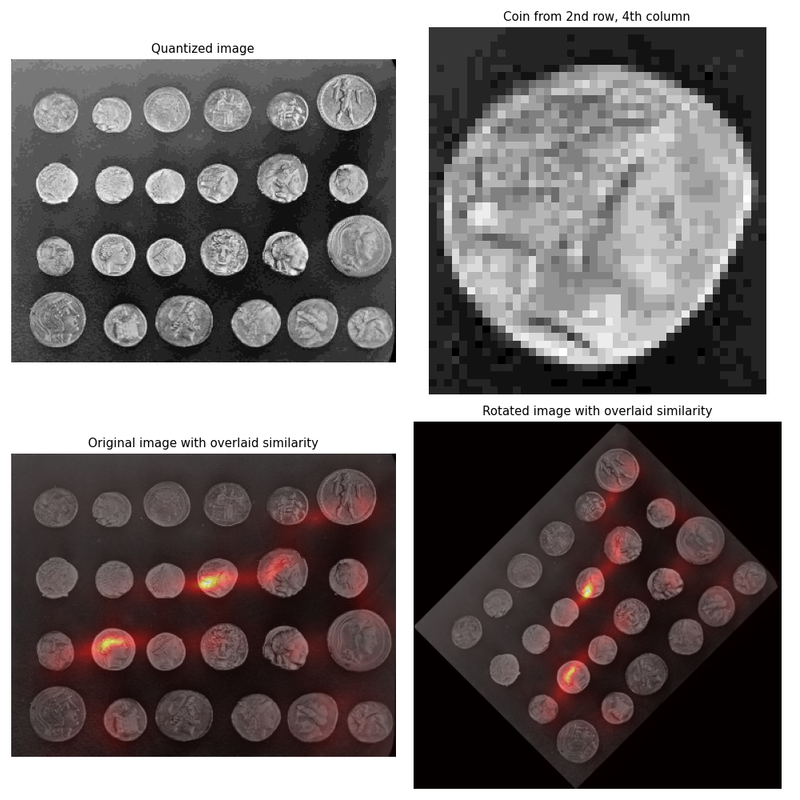 To demonstrate the rotational invariance of the technique, the same test is performed on a version of the coins image rotated by 45 degrees. S.Perreault and P.Hebert. Median filtering in constant time. Trans. Image Processing, 16(9):2389-2394, 2007. # and high when distance is low; taking the reciprocal will do this. # Chi squared will always be >= 0, add small value to prevent divide by 0. # Select the coin from the 4th column, second row. # big enough for other coins too.